For reliable Huntington Park taxi service, Fiesta Taxi can provide you with fast, professional and courteous service at any time of the day or night. Simply download our easy-to-use app and you will have great taxi cab service at your fingertips any time of the day or night! This South Gate taxi company serves the area with friendly drivers who can always make time to see to customer needs and can transport you quickly and safely to your destination. Call for Montebello taxi service and find out how easy it is to get where you are going with Fiesta Taxi. If you live in the beautiful Huntington Park area, you can enjoy many events close to home by booking a Fiesta Taxi ride. Huntington Park, one of Los Angeles's southeastern Gateway Cities, is a lovely town of about 58,000 people that borders Bell, Maywood, South Gate and Vernon. The city has been incorporated since 1906, when it was created as a streetcar suburb for Los Angeles. Today, remnants of the city's history can be seen in its beautiful Spanish architecture and wide streets. Huntington Park is known for its weekly farmer's market, where shoppers can find bee products, produce, plants and fresh eggs. South Gate, nicknamed "The Azalea City," is another of Los Angeles's Gateway Cities, has a fascinating and rich history. The city was once part of the Lugo family land grant and is named for the "south gate" of that immense ranch. About 96,000 people call South Gate home today. Fiesta Taxi is proud to serve this richly diverse community and to take patrons to many exciting events in and around the city, including activities at the Margaret Travis Senior Center and youth dance classes sponsored by the Recreation and Parks Department. Montebello means "beautiful mountain" in Italian. This wonderful city of 62,000 people combines some of the best of Los Angeles living in one of its Gateway Cities. The city was built on the site of the original Mission San Gabriel Arcangel and later became known for its production of beautiful flowers in large farms around the area. Today, Montebello is home to Kaiser Permanente, Bimbo Bakeries and Beverly Hospital. Residents can rely on Fiesta Taxi to get them to all of these points of interest as well as exciting events throughout the year. At Fiesta Taxi, our drivers are courteous, safe and well-trained. We know the area because we are locals ourselves. We provide fast, friendly taxi cab service in Montebello, South Gate and Huntington Park as well as other areas in and around Los Angeles. Call for service. 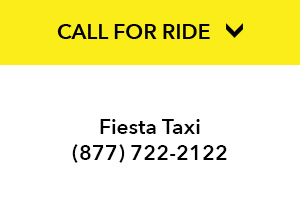 As always, you can book your Fiesta Taxi through our friendly telephone dispatch service. We will send someone to pick you up as soon as possible when you call us at (877) 722-2122. Online. You can now visit our website and book directly by inputting your pickup address. You can even schedule your cab pickup for later in the day. You can also download the Curb app so that you can track your taxi cab and pay through your phone. With friendly service, fast pickup, safe driving and a variety of ways to book, including online and via your smart phone, you have every reason to choose Fiesta Taxi. Contact us today! 2017-2018 © Fiesta Taxi. All rights reserved.